Choose Conejo Valley Heating & Air Conditioning when you need fast, effective, and guaranteed trustworthy water heater repair services. 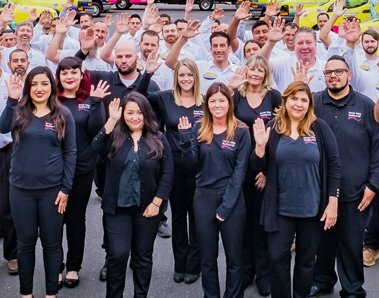 We have been providing high-quality efficient services in Southern California for past 38 years and claim to stand as the most trusted expert for Water Heater Repairs. We provide potentially experienced and skilled water heater service technicians in Ventura County, Santa Barbara County, Los Angeles County, and Conejo Valley. Water heater fulfills your need for hot water all the way to your complete house, so it is important that the heating system must work properly. One thing is very necessary to remember that apart from repairing issues, maintenance should also be the concern. 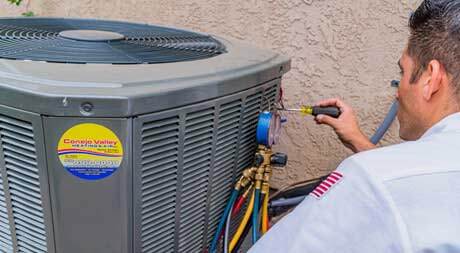 We are the most trusted HVAC contractor, providing professional water heater installation and repair services. If you’re experiencing issues with your water heater, consider calling in the professionals at Conejo Valley for fast and affordable water heater repair services. We work with all major makes and models of a water heaters. Each task is completed by our experienced plumbers who truly care about your satisfaction. If you are dealing with a leaking tank, significantly reduced water pressure, fluctuations in temperature, or other common problems, we are available to help. 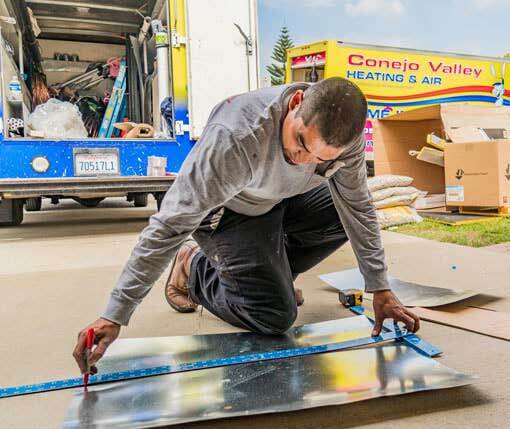 In fact, our emergency plumbing service teams offers their services to our patrons, so even during the night, you can count on the plumbing team at Conejo Valley Heating and Air Conditioning. 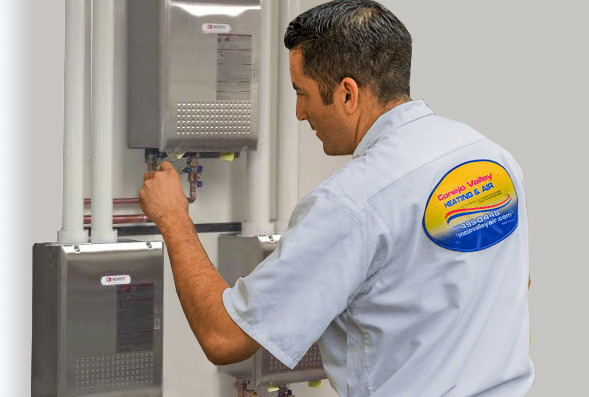 Conejo Valley Heating Service offers 24-hour emergency water heater repair service. If your water heater stops working at an inconvenient time, our heating experts can help. If you have an HVAC emergency, our qualified technicians are available 24 hours a day. A few different factors affect the cost of repairs. The complexity and severity of the issue may change the cost of repairs. Call us or request an appointment online to find out more about heat pump installation! There are some common problems that can happen with the water heater, such as, discolored water, foul-smelling water, leaking tank or odd noises coming from the tank. For instance, water temperature issues tend to be one of the most widespread issues experienced in the area. The cause of such problems usually arises from the thermostat on the tank itself. On occasion, the thermostat must be replaced or maintained to ensure it operates as projected. If there is no hot water in the device, the heating element is probably not working. This mechanism can be replaced. Alternatively, odd noises coming from the water heater itself could point to sediment being burned by the heating element in the tank, or the heating element itself. Both will make noises as they deteriorate and burn out. It is worth it to check the system every once in awhile, as most problems will go unseen by homeowners for quite some time. If a replacement of a water heater is essential, our water heater experts will help you determine which sort of solution is right for your home and within your budget, considering your family’s water heating needs and energy usage expectations. A heating element and a water storage tank are required in conventional heaters. The storage tank holds the heated water till it needed. These water heaters have only one drawback: when the stored heated water is consumed, it takes some time to heat the water for usage. These water heaters are very simple. The latest energy saving units are very light. Our company provides prompt and efficient services with warranty for installation and repair. The tankless water heater heats the water when it is required. In the latest units, there are computer chips and high power elements. As the hot water faucet is turned on, the sensors sense the need for hot water from the flow of hot water and the elements starts working. As the water flows across the heating elements, it gets hot. It takes only a few seconds to produce hot water and stops working as the faucet is turned off. Thus, it saves energy. These heaters have an average life of 20 years and have no problems related to hard water since there is no water storage. There may be some problems with water pressure and electric default. These problems can easily be detected and promptly removed by our well-trained technicians. Hybrid heat pump water heaters are the latest concept in water heating. It extracts heat from the air and then used for water heating. This pump needs more space and hot weather conditions are suitable for it. Moreover, its installation cost is very high in comparison to other water heaters. Once installed, it reduces water heater expenses by 60 % to 70 %. Solar water heater consumes energy from the sun. A solar unit is installed on the roof for proper sunlight. There are two types of solar water heating system. An inactive solar water heating system works by circulating water through the solar collectors and then goes back to the storage tank. This is suitable for sunny weather, otherwise, the water may freeze. An antifreeze system is a passive solar water heater that does not allow water to freeze. Solar water heaters are efficient but expensive. It needs regular maintenance. If installed, energy bills are low. There are financial incentives and rebates from the state. Regular maintenance is required for a longer life of a water heater. From time to time, repairs are required to meet some common problems like lukewarm water, a small flow, or a leak. But if you don’t have enough hot water, you may replace yours with a new, high-efficiency model water heater. 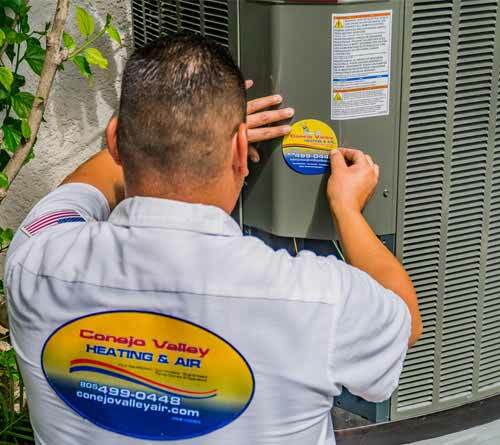 Conejo Valley Heating & Air Conditioning can recommend a few new systems that may suit your requirements. Whether you decide to repair or to replace your water heater, you can contact us. Our technicians are prepared to tackle the job. In electric water heaters, upper and lower heating elements are used for heating water. An insulated storage tank jacket is made of steel with insulation between the storage tank. The tank jacket is used for heat loss of the heated water. If there is no hot water in the water heater, this may be because of a lack of power to heating the elements, such as tripped circuit breaker, a blown fuse handling water heater circuit, a faulty electric thermostat, or a faulty upper electric heating element. Firstmost, customers have to make sure that hot water demand does not exceed the capacity of the water heater. The water heater produces the minimum of 75% of its capacity as hot water. If the size of the water heater is sufficient enough, cold and hot water connections may have crossed, a fault in the plumbing installation, or a fault in a lower electric element. Sometimes, the water may be too hot. If so, it’s possible that your heating unit thermostat setting are too high or less, or your water has a high mineral content, which causes oxidization of the heating elements in your heater. Leakage of water can be caused by leaking valves, poor plumbing connections, or from the tank. There are a number of steps you should take to stop and fix the leak. Start by shutting off both the water supply of the heater and the electrical power. If water comes out of the faucet with a brown, yellow, or red tint, there could be rust occurring inside your water heater tank or the pipes in your home. If water comes out smelling like rotten eggs, there could be bacteria in the tank. You might need to replace your anode rod. Call qualified technicians at Conejo Valley Heating and Air Conditioning to repair your water heater. Are there noises coming from your water heater? Does it sound like a low rumbling or a popping noise? Or a high pitched whine? The noise you’re hearing may be the sound of boiling water. Excessive buildup of sediment in the bottom of the tank causes the bottom of the tank to overheat and boiling water to occur. Differentiate conventional and tankless water heater. Conventional water heaters store water at the forefront of time and use your home’s electricity or gas power to heat somewhere between 30 and 50 gallons of water. Tankless water heaters store no water ahead of time; it heats the water as per the customer’s need. It can save you a lot of money on utility bills, in the long run. Tankless heaters are a little costlier, but the advantage of the 15- to 20-year lifespan makes it worth it. Is there any charge for an in-home visit? Yes, an analytical fee will be charged when the technician will analyze and then resolve the problem. The fee will be included in the final cost of the repair. What does an in-home visit include? After setting up an appointment, which includes an in-home analytical fee, our technicians will examine your water heater and review the problems. He will recommend any needed repairs and provide you with a quotation for the total cost. Then, you will have the choice to proceed with the repairs, decline the repairs, or replace your water heater completely. 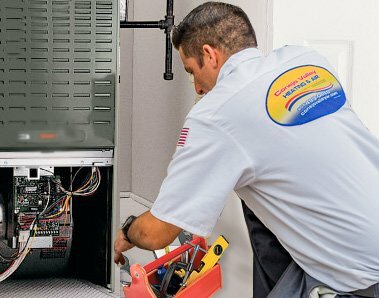 How much time do technicians take to repair the water heater service? Repair or replacement work can be completed the same day if you call before noon and if the technician has the parts on hand. The diagnosis and repair should not take more than 1 to 2 hours. Yes. The repair work is warranted for days.